Whether you’re in an unfamiliar hotel room or crammed in the middle seat on a long-haul flight, these pillows, blankets, and PJs will have you dreaming big in no time. The best travel products are often the ones that pull double-duty. Case in point: Tumi’s puffer jacket ($195) that converts to a neck pillow. Simply stuff the coat’s body into the hidden pocket in the collar and drift off to dreamland. Toss one of these pillowcases ($79) into your carry-on to add a touch of luxury to your next business trip. Not only will the silk keep frizzy hair in check and skin feeling soft, but it’s also hypoallergenic, making it essential for travelers with asthma or allergies. Consider this set ($45)—which comes with relaxing bath salts, body butter formulated with soothing Melissa and lemon myrtle essential oils, a sleep-inducing pillow mist, and a sachet of chamomile tea—the cure for a serious case of travel insomnia. Plus, the pouch is perfect for storing cosmetics on future trips. Courtesy of Best Made Co.
Gone camping? Drift to sleep mapping the stars with an old-school constellation map ($16). Hotel pillow too soft? Firm it up with an inflatable support insert ($20) that can be customized to fit your sleeping preferences. No beauty product can promise a restful sleep, but Fresh’s firming overnight mask ($92) does guarantee that you’ll awake ready to put your best face forward. Bone-dry sinuses make for uncomfortable snoozing. Invest in a portable humidifier ($50)—just add a water bottle from the mini-fridge—to ensure you sleep soundly. Block out city sounds, croaking frogs, and snoring spouses with a pair of dachshund-inspired earplugs ($34). Prefer something a bit more standard? These foam ones will do the trick as well. We’re biologically wired to sleep in the dark. Dim the light from the midnight sun (or your seatmate’s excessively bright iPad) with a too-cute eye mask from Morgan Lane ($110). This hydrating lotion ($22) both nourishes dry skin with shea butter and lulls you to sleep with a calming lavender scent. Step up your snoozin’ attire with this set of super-soft pjs from Eberjey ($120). Even with packing space at a premium, the SoundScreen from Marpac ($45) is well-worth its weight in a carry-on. Clocking in right around two pounds, it camouflages honks for New York cabbies, crying infants, and unruly hostel mates with a soothing whir to ensure you sleep through the night. Need a good night’s sleep? Nix the nightcap, and opt instead for a cuppa bedtime tea ($19), a caffeine-free brew with organic chamomile, valerian, and passionflower. 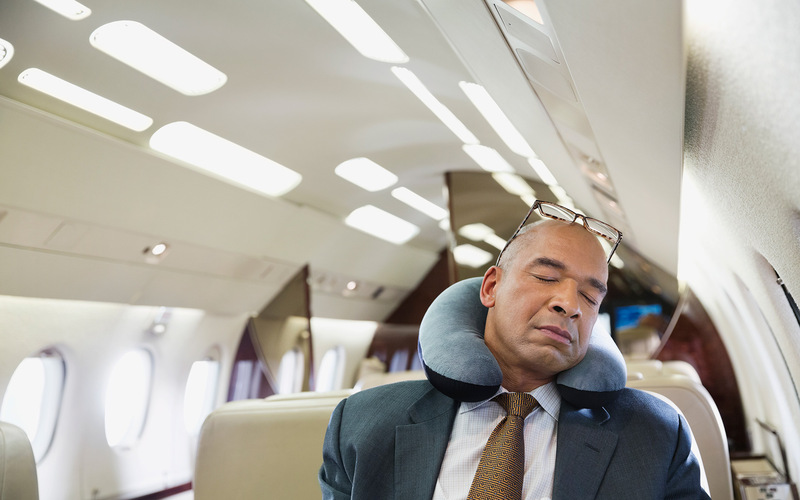 You’ll never question the cleanliness of an in-flight blanket when you bring your own. Snuggle up on your next red-eye with this colorful, jersey one from Flight001 ($30). Better yet, the pouch becomes a pillow when the blanket's not in use. Sleeping in on vacation is key. Slather your skin in La Prairie’s Sleep Mask ($315) before bed to shave minutes off your morning beauty routine. Read: It’s okay to hit that snooze button one more time.